The Chablais Alps are a mountain range in the western Alps. They are situated between Lake Geneva and the Mont Blanc Massif. The Col des Montets separates them from the Mont Blanc Massif in the south, and the Rhône valley separates them from the Bernese Alps in the east. 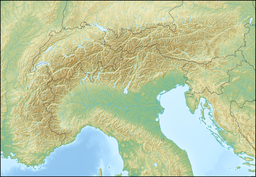 The Chablais Alps are composed of two distinct parts separated by the Val d'Illiez: the Dents du Midi massif on the south which contains the highest peaks, and the alpine foothills on the north. This page was last edited on 12 November 2017, at 14:55 (UTC).